We want to remind our permittees about the high fire danger during this extreme fire season. Our land is currently open for walk in access only and we hope to keep it that way. However, things are very dry as we’ve not had any significant rain in over two months. Please keep this in mind when recreating on our land. Check our website for any updates. If conditions worsen and we have to shut our lands to public access, we will let you know by email. From our friend Helen Higgins, CEO, Corvallis Boys and Girls Club of Corvallis. Barte was born in Corvallis to Bruce and Betty Bond Starker. 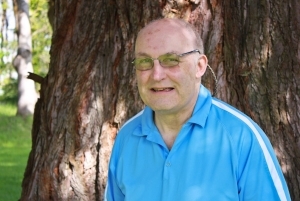 He graduated from Corvallis High School in 1968 and from Oregon State University in 1972 with a degree in forestry. At age 22, he entered the family business, Starker Forests, and worked there until his retirement. In 1978, he married Patricia Lemon. They raised two daughters and hosted several exchange students from around the world. 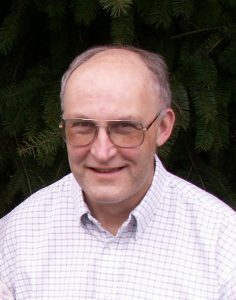 Barte served on many forestry boards and committees throughout the state including the Oregon Board of Forestry, the Oregon Natural Resources Education Fund and the Oregon Forest Resource Institute. He was also involved with the Oregon Coast Aquarium, the Good Samaritan Hospital Foundation, Rotary and the Boys and Girls Club of Corvallis. He is survived by his wife, Pat, his daughters Sally Starker (husband Zach) and Wendy Little (husband Matt), three grandsons, and his brother, Bond Starker. A memorial service will be held Saturday, January 6, 10:30 am at the Philomath Scout Lodge, 660 Clemens Mill Road, Philomath. Corvallis Boys and Girls Club Teen Center, 1112 NW Circle Blvd., Corvallis, OR 97330. The Oregon Community Foundation (specify the Oregon Natural Resources Education Fund or ONREF) at The Oregon Community Foundation, 440 East Broadway, Suite 160, Eugene, OR 97401. It is with sadness that we announce the passing of Barte Starker, on December 12, 2017. 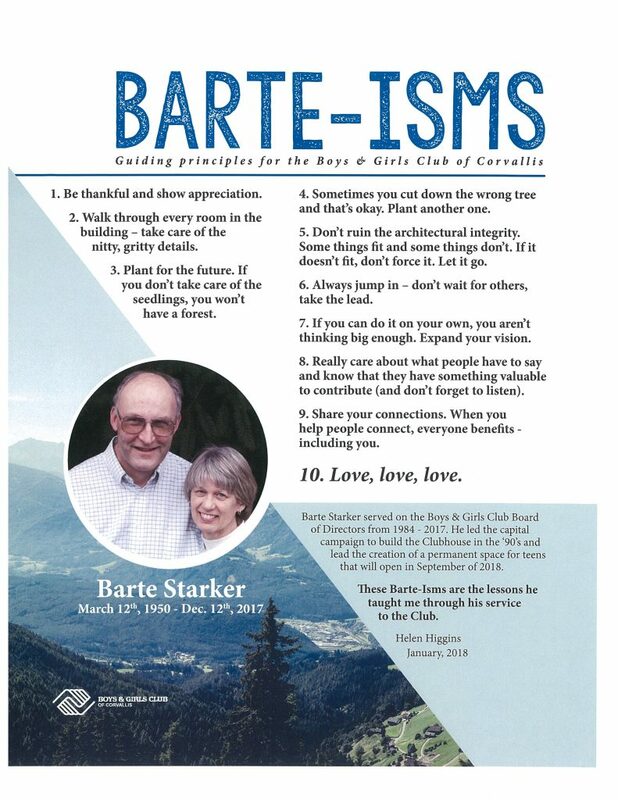 Barte was an inspiration for all of us who worked with him at Starker Forests, Inc.. His passion and love for forests and active forest management was contagious. That legacy will live on in his family and many colleagues. Barte was a great man. Here is the article by Bennett Hall from the Gazette Times newspaper. Fire season and regulated use are over. We will start opening gates for drive in hunting starting today. The gates will be open as we get around to different areas. Please be patient as it may take a couple days to get to them. All the gates that are going to be open should be open by Friday afternoon. Please make sure you have your permits to access our lands and remember to be safe and courteous to others! We are still waiting for ODF to declare an end to fire season on the West Oregon District, where most of our lands are located. Red Flag Warnings continue across most of Oregon today, as well as continued extreme heat warnings and air quality alerts. Conditions on the ground remain ideal for new fire starts and extreme fire behavior on existing fires. Human-caused fires have continued to be an issue on Oregon’s forestlands. Please do all you can to help prevent human-caused wildfires. Know and follow the fire restrictions and closures for where you are located or will be traveling. To find that information on ODF-protected lands, go to http://www.oregon.gov/ODF/Fire/Pages/Restrictions.aspx. There is a good news – bad news scenario shaping up for later in the week. We could get some moisture in some areas, but there is a chance it could come with lightning. The forecast this morning indicated that we could move out of the Red Flag conditions for very dry and unstable conditions, to a Red Flag for thunderstorm on Thursday. We are at a critical drawdown level for the ODF West Oregon District this morning. This means fire fighting equipment and personnel are elsewhere. With the significant growth of the Eagle Creek fire in the Columbia River Gorge, ODF West Oregon District sent two engines that way this morning. ODF is slowly getting some of their other resources back from other fires (that have timed out after 14 day assignments), but the call for resources on all of the fires is still outpacing our ability to meet all the needs. Many of the other large fires that have been on the landscape for a while saw significant growth yesterday and last night. Starker Forests lands remain open to walk-in recreation and hunting. Please help us continue to have no fire starts on our lands this year. Due to increasing fire danger the Oregon Department of Forestry has, on July 17, 2017, ordered new regulations on forestlands protected by the department in our area. All Starker Forests lands are covered by these regulations. Possession of the following firefighting equipment is required while traveling, except on state highways, county roads and driveways: one shovel and either one gallon of water or one operational 2½ pound or larger ABC rated fire extinguisher. Smoking is prohibited while traveling, except in vehicles on improved roads. Open fires are prohibited, including campfires, charcoal fires, cooking fires and warming fires. Non-Industrial chain saw use is prohibited. Use of motorized vehicles, including motorcycles and all-terrain vehicles, is prohibited, except on improved roads. Cutting, grinding, and welding of metal is prohibited. Mowing of dried and cured grass with power driven equipment is prohibited, between the hours of 1:00 p.m. and 8:00 p.m.
Also prohibited throughout fire season are backyard debris burning, the use of exploding targets and the use of tracer ammunition. Sky lanterns are prohibited year round in Oregon.